From left, bee keeper Bill Mathewson, farm manager Jose Gomez, and almond farmer Richard Enns check the health of some bee hives that within a few days will be busy pollinating Enns' orchards as the trees begin to bloom. Enns says he spends $100,000 on bees to pollinate his almonds. With Kern County's almond bloom expected to get under way this week, Geordy Wise sure is glad he lined up his bees last fall instead of waiting. 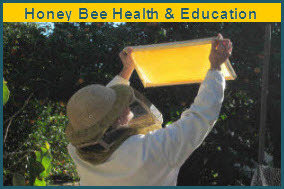 The Shafter and Wasco-area orchard manager said he ended up paying between $150 and $185 per hive -- high prices, to be sure. But they're well below the $200 to $225 others are reportedly shelling out lately amid a nationwide bee shortage. This year's almond pollination may well set records, not only in terms of hive prices but also for bee colony losses that have claimed 40 percent of some beekeepers' stocks, and in some cases much more. 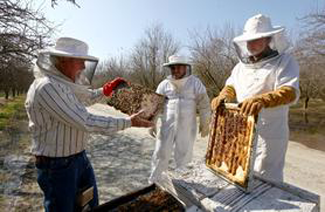 Commercial beekeepers say a combination of factors is to blame: disease, a harsh winter, drought in much of the United States and government restrictions on a popular mite treatment, not to mention increasing demand by California's expanding almond industry. "It's the worst year I've ever seen, really, in about 30 years, as bee losses go," said Joe Traynor, a widely respected bee broker in Bakersfield. Bees have been a source of concern around the world for years. A mysterious ailment called colony collapse disorder began devastating bee populations in 2006. How much the disorder contributed to this year's losses is unclear. Some almond growers wonder whether the concerns -- and the hive prices -- have been overblown. They emphasize that yearly ups and downs will always be part of working in agriculture. "I think it's like anything, like the farming," Wise said. "What you put into it is what you're going to get out of it. I think there's better beekeepers than others." Beekeepers say this year was different in several ways. About half the bees needed to pollinate California's almond bloom come from outside the state, including places struggling with a drought that has reduced forage and weakened bees. 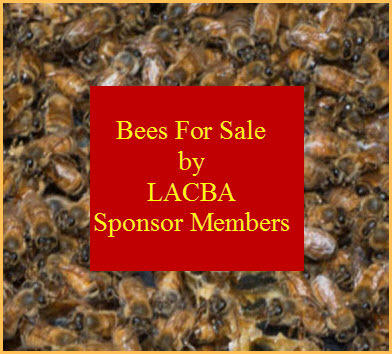 Jeff Vicknell, who sells bee medical treatments and nutritional supplements out of a warehouse off Weedpatch Highway, said he has watched beekeepers struggle this year with severely malnourished and sick colonies. This year more than in years past, he said, beekeepers are paying dearly to keep their bees healthy -- sometimes to no avail. "These are people that know what they're doing, that have been in the business all their life, and now there's no hope," he said. Montana beekeeper Bill Dahle said he lost 10,000 colonies over the past year, leaving him with only 3,000. He reckons it's his worst year in three decades. "We'll be back again strong as ever," he said stoically. "It's just one of those glitches." The situation has obvious implications for California's thriving almond industry, which in 2011 sold product valued at nearly $3.5 billion. "We need a chain of food and forage for these bees all the way through the year," said Bob Curtis, the almond board's associate director of ag affairs. Paramount Farms, one of Kern County's leading ag producers, contracted some 92,000 bee hives to pollinate its 46,000 almond acres this year. It's not as many bees as the company would like, but with Paramount's focus on working closely with beekeepers to ensure strong colonies, company bee biologist Gordon Wardell said it will suffice. He likened Paramount's balancing act to having too little icing for a big cake. "What you do is you just spread the icing a little bit thinner around it. And that's what we're doing with the bees," he said. "These same growers this year thought they'd wait till the very end to get bees again, and there was a shortfall of bees," he said. Now, he added, "they're being gouged, if you want to call it that. ... They're panicking." Whether the hold-outs will have much selection this year is hard to say. But anecdotal indications aren't good. "Nobody raised their hand," Jupe said.